Silicone Valley may have been the first stage in which a new statement was made in men’s fashion. Its fair to say the movement away from formal attire started in the tech industry. Young office workers aren’t showing up in suits, but in jeans and a hoody. So how does the more contemporary man who wouldn’t necessarily be attracted to a briefcase haul his stuff around? The man purse has been the brunt of more than one joke since falling out of fashion at the beginning of the 20th Century. Today’s man will carry more than a comb and a handkerchief. So what’s a guy to do? awhile, but they are at the forefront of choice once again. They have continued to get more popular and definitely better looking. Although there are dozens to choose from, I’ve listed a few of my favorites. 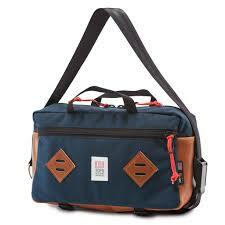 Coming in number one is by Canadian Designer Herschel Supply Co. They have long been known for their more fun line of candy-colored and light attitude, multi shaped and size bags, so there’s no surprise that their Pop Quiz Messenger Bag is a big hit. Priced at only $80 US it is a classic. It boasts features that include a striped lined interior and a padded, fleeced-lined sleeve. It’s sleek, but big enough to hold a 15 inch laptop. Another top contender is the Arc’teryx. If you are one of the many communters who ride their bike to the office, the Lunara Messenger Bag is for you. This British Columbia outfitter has been making gear for the adventurer since the late 90’s. It has a low profile, sleek all-black design that offers a major advantage. With a ventilated backing it reduces sweating while you are wearing it and keeps you from showing up at the office after biking 5 miles still feeling dry. This Messenger comes with a price tag of just $89. With two Canadian companies topping my list I want to tell you about a bag that comes from a little closer to home. 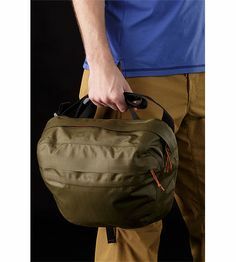 Colorado based Topo Designs have been creating quality in outdoor gear since the 1980’s and their Mini Mountain Bag is worth the additional bucks selling on-line for $139. The attention to detail is what sets it apart along with its style and design features. Easy to spot the red zipper pulls and the lower cinch straps for storing a jacket or umbrella gives it the edge. Some might save this Messenger Bag for the weekends but, its hip enough to take the trip to the office week days. Just one more then I’m off, but I couldn’t go without mentioning the Tom Bihn Cafe Bag. Its got the Tom Bihn durability factor as well as the practicality of being water resistant. 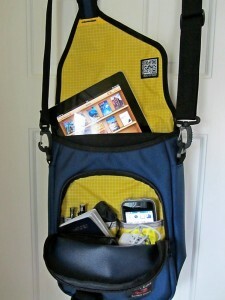 It comes in a variety of color combinations and has a multitude of interior and exterior pockets to stash your stuff. The Cafe Bag comes in larger and smaller sizes. If you like to customize your individual look, this should be your first choice. At a decent price of only $65, you can’t go wrong. Do you have a favorite Messenger Bag, or one that has caught your eye on the commuter train? Leave a comment below and let us know what it is and why you can’t live without it.